This novella was a great introduction to the Covenant series, which I have yet to read. I am usually not one to read a pre-quel, to be honest. I prefer to read the first book and then go back. I feel as if I learn even more from doing so. But I was too tempted to get a glimpse without having to immerse myself in a brand new book at this time. As always, JLA has me wrapped right into another one of her stories. She really has the ability to pull you in within the first few paragraphs of her stories. 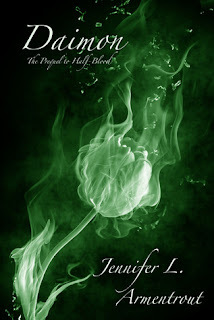 I am totally intrigued by a series of books that is based on Gods, Pure Bloods, Half-Bloods and anything in between. I am a lover of mythology and this will fit right in with that! So far I really love Alex (Alexandria). I can feel her sorrow and pain at the loss she has experienced. I can feel her determination at needing to keep going and find out what her purpose really is. I can feel her fear. As always, Armentrout makes the feelings of her characters palpable. And Armentrout's writing style is easy and flowing. She makes you want to just keep reading and turn her pages. There was nothing dull about this story. And, despite there being barely any dialogue at all, I still felt like I wanted to keep going and was never bored. I am really looking forward to reading Half-Blood! 4 out of 5 stars from me, only because it left me wanting so much more!